Kitchen Exhaust Hood Cleaning in West Hollywood CA | Flue Steam Inc. Kitchen exhaust hood cleaning in West Hollywood CA is a relatively simple process, but that doesn’t mean that you should try to handle it yourself. In order to get a truly effective cleaning and fulfill your code obligations, you need to get professional help. 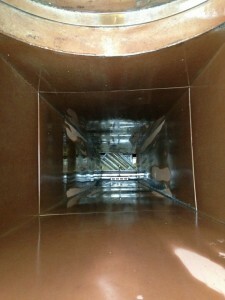 Flue Steam is an excellent contractor to call for all of your exhaust hood and exhaust system cleaning needs. We can not only scrape clean your exhaust hood, but also provide grease filter exchange service, steam cleaning, and exhaust fan repairs. When to get your kitchen exhaust hood cleanings depends on what types of foods are cooked in your commercial kitchen. The more meats or fried foods you cook, the more vaporized grease will end up in your exhaust system, and the more frequently you will need to invest in kitchen exhaust hood cleaning in West Hollywood CA. Most fast food kitchen exhaust systems need to be cleaned monthly. At Flue Steam, our hand scraping service provides an economical way to deal with grease buildup on the most visible part of your exhaust system, namely the hood. We recommend pairing this service with a more thorough steam cleaning of your entire exhaust system two to four times per year, depending on how fast your grease deposits accumulate.